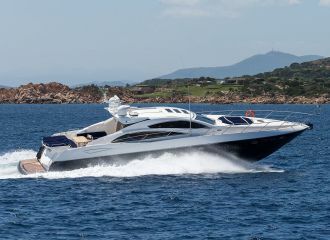 Kept in excellent condition, this Aicon 62SL yacht is ideal for a yacht rental in Sardinia or Corsica. The yacht offers great space for her size and guests will be able to relax either on the aft deck (the dining can be converted into a sunbathing area) or on the foredeck. If you’re looking for a 3-cabin yacht rental in Sardinia with your family or your friends, look no further! Charter guests will have the best yachting holiday onboard this Aicon 62SL. The yacht is run by a professional Italian crew of 2 who will assist with your every need. total 4000	€ Excluding VAT and APA ?